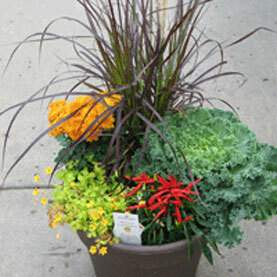 Container gardening is a fun and exciting way to enjoy gardening in a limited space or in areas where we would not otherwise be able to plant. Think Big! When it comes to growing plants in pots, the larger the container, the better. Starting plants in larger containers will result in healthier root systems, less watering, and will produce more flowers and healthier foliage. If you plan to use window boxes, keep in mind that their relatively shallow depths will cause your plants to dry out faster than they would in a deep container. One way to get around this potential problem is to fill your window boxes with plants that use less water, such as Geraniums, Ivies, Grasses, Scaevola, and Osteospermum. For the best results be sure to choose plants with similar needs and habits (don’t mix a plant that likes it hot and dry with one that needs shade and lots of water. Place your plants in the container at the same depth they were in their original container and be careful not to overcrowd the plants. This will cause problems as the plants grow and fill out. Water There is no set formula for watering. The best indication that it’s time to water is when the potting soil just beneath the surface feels dry. In hotter weather, this could mean watering every day, or as little as once a week during cooler temperatures. For the Minnesota hot summer days, try “Soil Moist” for better moisture retention (available in Wagner’s fertilizer section). The correct way to water is to gently drench your plant until you see a trickle of moisture coming out of the drain hole. As you get to know your plants, you’ll develop a “feel” for how much water they need. It’s important that you don’t allow a container to dry out completely as this can cause the plants to wilt, delay flowering and ultimately die. Too much water, however, can cause root rot. Fertilizer Plants get many nutrients from the soil and use their roots to break down minerals found in the soil. These nutrients and minerals are not always available in containers. Because containers need to be watered more often, nutrients tend to be leached out of the soil and therefore need to be added more frequently. For best results, we recommend using both time release and water-soluble fertilizers. While many people think that time release fertilizers react to water, it’s actually heat that causes the capsules to release their nutrients. As a result, plants get food when they need it most – during those hot summer days. If you’re potting up your own containers, add some time-release plant food to your potting soil. Weekly feedings with a product such as Miracle Grow or Bloom Pluscan assure you of having a healthy, productive container garden. Soil The dirt in your garden beds may be great for growing plants in the ground, but plants in pots are a different matter. When used in a container, even the best garden soil has a tendency to settle and harden – a condition that stunts root growth. Garden soil also contains a certain percentage of insect larvae, weed seeds, and harmful spores. On the other hand, a prepared potting soil such as Wagner’s custom potting mix, is specially formulated for potted plants and contains a mix of sterilized peat moss and perlite that provides the correct levels of aeration and water retention. If you are using an extra large container and want some additional weight, fill the bottom of the container with a layer of gravel/sand before adding the potting soil. The gravel will also improve drainage in the pot or pot feet can be used to keep the drainage holes open. Container Placement Be careful to choose your plants for the area where the pot will be placed. Containers near a wall or fence or sitting on a step or deck may become much hotter than you first think. A hanging container on the corner will be subject to greater wind gusts. Protect your containers from extreme conditions and be aware of their special needs. Also, because the container itself absorbs the suns rays and heats up, potted plants tend to dry out faster and grow faster than those planted in the ground. End of Season Care For the best results containers should be emptied at the end of the season and stored in a protected area. If you are unable empty the container, remove all plant materials and allow soil to dry out so as to prevent freezing and cracking of the pot.